Preferred Habitat: Woodlands and swamps. Seasonal Occurrence: Abundant in spring, summer and fall; less common in winter. Breeds in our area. Profile by Lark Heston: This seemingly hunch-backed bird can be a difficult one to spot. Both species of North American night-herons, yellow-crowned and black-crowned, forage mainly at night and spend most of the day hidden among branches near a body of water. These two birds can be differentiated easily by their plumage on and around their head. 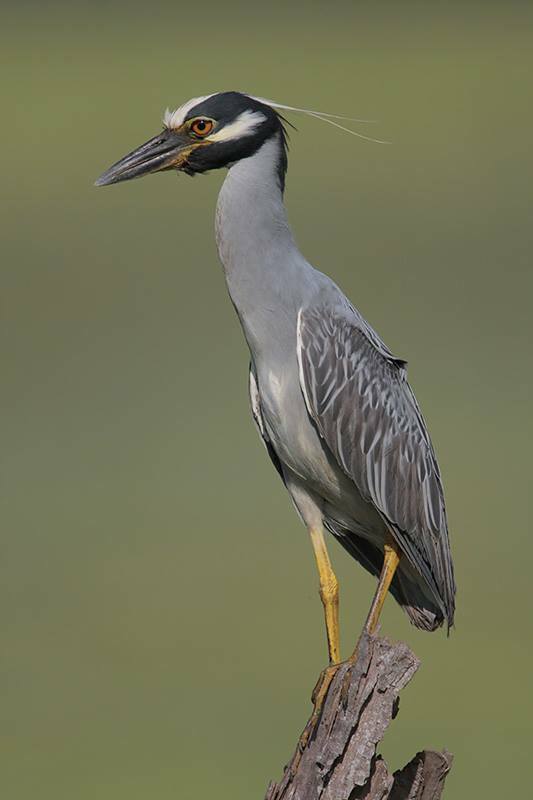 The most obvious difference is stated in their names: Yellow-crowned Night-Herons have a yellow crown and Black-crowned Night-Herons have a black crown. But that’s not the only difference! 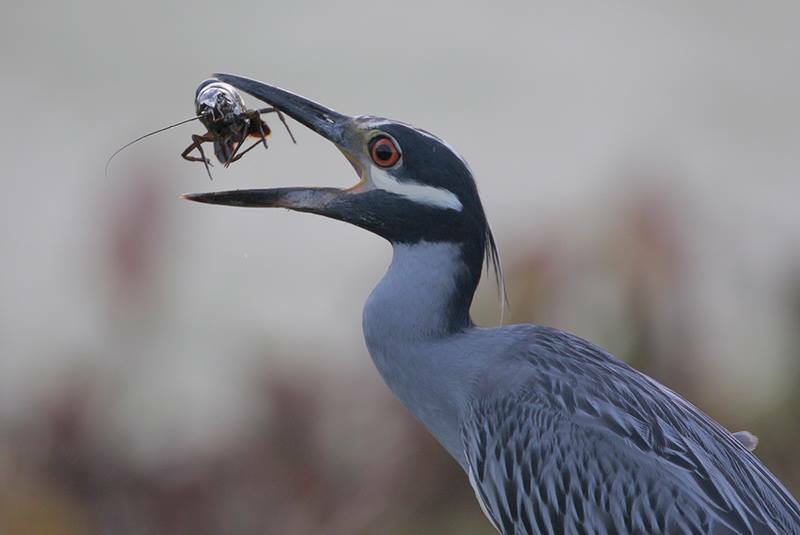 Yellow-crowned Night-Herons have a black head and face with a distinct thick white cheek stripe, whereas Black-crowned Night-Herons have a black head with gray on their face that extends down the whole front of the body. Yellow-crowned Night Herons also have a gray front and neck, but it contrasts greatly with their facial pattern. If seen only in flight and for a short glance, look at the length of the legs past the tail. 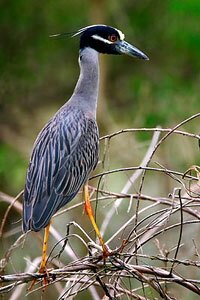 Yellow-crowned Night-Herons’ legs are longer than Black-crowned Night-Herons’ so they extend far past the tail. Other identifying features of a Yellow-crowned Night-Heron include a thick black bill, long and showy plume feathers that drape behind the head, and dingy yellow legs. Immature individuals take three to four years to reach adult plumage; they are brown overall, sometimes with a lightly developing white cheek stripe. 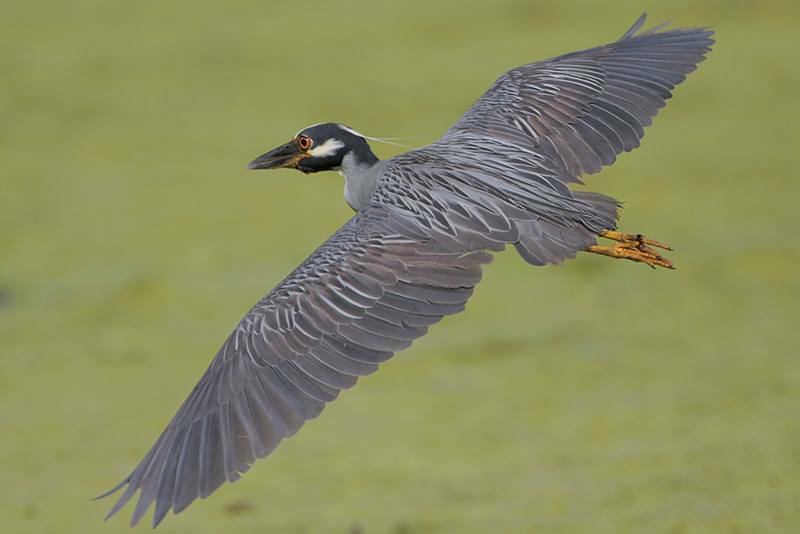 Yellow-crowned Night-Herons forage in both salt and freshwater, including marshes, ponds, ditches, swamps, and mangroves. As long as they can find crustaceans like crabs and crawfish to eat, they’ll forage, sleep, and nest in that location. The southeastern United States provides many suitable habitats for this species, although they can also be found as far north as Ontario. When these herons are ready to mate, they will perform display flights and males will also perform a neck-stretching display that the female may or may not repay. 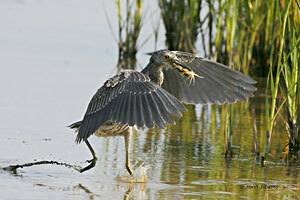 A pair will nest solely or with a large group, sometimes intermingled with other heron species. A handful of these birds can be seen around Claybottom Pond in High Island, so come check them out as we’re nearing prime breeding season in March when this was written.